How can you improve your self if you can’t quantify your self? Some data pointers for your New Year. It’s that dreaded time of year again when we make New Year’s resolutions and try our best to keep them. Thankfully, whether it’s hitting the gym, eating healthier or, err, flossing more regularly, quantified-self apps and devices can help us. Here are five steps to keep in mind for a happy—and well-measured—2015. With more press than ever, and the launch of new devices like the Jawbone UP3 and the Microsoft Band, 2014 was the year of the fitness tracker. And with the Apple Watch on the horizon in early 2015, this year looks to be even bigger. Forget simple step-counting algorithms, the new crop of devices offer all manner of smart trackers–from pulse rate and calories burned to sleep pattern and (soon) sweat analysis. With Lift, you don’t have to be alone. You can invite friends to keep each other accountable to your goals or even hire a personal coach to privately chat with through the app. 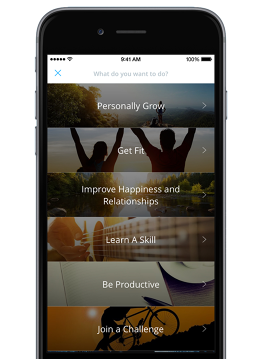 If you want a human touch with your fitness tracking, we’ve also witnessed the recent rise of services like personal coaching app Lift, which combine wellness tracking with a community-based personal coaching service. The concept of recording your steps over time is one that doesn’t seem unusual, but for many people the idea of mood tracking is less common. That’s a shame, because today’s range of mood-tracking apps offer a great way of keeping tabs on arguably our most important metric: how happy we are. If you’re looking to keep an automated mood diary going into 2015, you’re spoiled for choice. 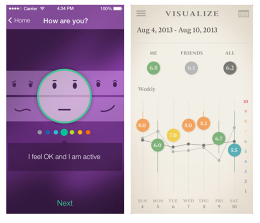 From EmotionSense and gottaFeeling to Moodlytics and Moodscope, there are plenty of quality apps out there that can help you keep track. Two of my personal favorites are In Flow and Expereal. When you log your mood using In Flow, you enter both your energy level (signified by a smiley showing everything from tired to alert eyes) and emotion (from frown to smile). It’s then possible to tag your location using Foursquare, your companions at the time (using your phone contact list), what activities you’re engaged in, and any additional notes or pictures you might want. 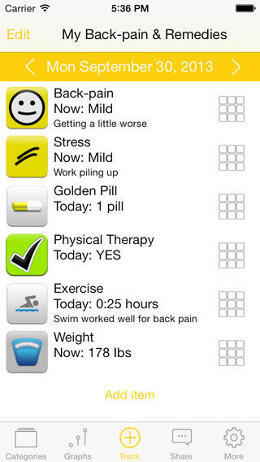 Expereal, meanwhile, offers similar tagging functionality, but with an even simpler measure: asking users to “rate their lives” using a 10-point scale at different times of day. With both of these tools, it is easy to enter information, but over time you begin to gather incredibly deep data collections–allowing you to analyze behavior patterns to work out what you need to do to be happier. 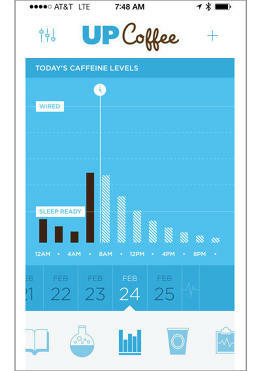 There are some pretty nifty data visualization features, too. Not everyone wants the same thing out of life. Fortunately, today’s range of neat, goal-oriented apps means your quantify goals don’t have to be limited to walking 10,000 steps per day, but can relate to anything from drinking more water, to spending less money on takeout food, to finally starting that business you’ve always discussed. The trick is keeping track of your goals in a way that adds value without complexity. 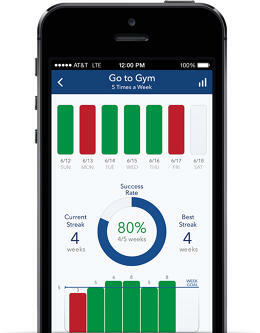 Strides divides goals into one of four different trackers: targets, such as losing 10 pounds by June 15; habits, like giving up smoking or working out regularly; averages, which allows you to keep track of averages over time; and milestones, which allow you to keep on top of anything that has steps or phases to it. All four are indicated through simple infographics, which clearly break down whether you’re sticking to your aims. If we asked you how many times you went to the gym last week you could probably answer pretty easily. If we asked how many cups of coffee you drink per day, that would probably be a bit tougher, but still possible. But what if we asked you how one related to the other–and whether the more coffee you drink, the less you sleep per night, and the less likely you are to want to exercise as a result? At this point, few of us could be expected to answer with any accuracy. Fortunately, today’s broadening quantified-self ecosystem is moving beyond simply measuring isolated metrics around activities and instead doing something far more useful: analyzing relationships between them. Take the coffee example, for instance: Quantified-fitness company Jawbone recently launched an app called UP Coffee, designed to let users track how much caffeine they consume–not just in coffee itself, but also in soda, medications, and a variety of foods. Since the associated Jawbone UP fitness band tracks sleep patterns, it’s therefore possible to cross-reference one data point with the other. Furthermore, Jawbone tracks how many steps you take, and therefore can help uncover even more unusual data lessons. For many users, going to bed just one hour past their bedtime average would lead to their losing 1,000 steps the next day. You know what keeps you awake? Coffee. The arrival of centralized health-tracking hubs like Apple’s HealthKit and Google Fit will only further help make sense of your data. Once you’ve discovered meaningful correlations in your data, the final step is acting on them. This could be something incredibly minor, which happens to make a big difference. Uwe Heiss, the developer behind popular universal life tracker TracknShare, says that he discovered an unusually strong correlation between his own happiness and daily flossing. In other cases it might be something so big you’re unable to realize it–such as the fact that your on-paper dream job makes you miserable. Once you can see the impact of these data points they become easier to change. Understanding that two minutes of flossing leads to a day of happiness somehow makes it easier to keep up. “In our rushed daily lives, our behavior is run by an overwhelming multitude of hardwired habits and desires,” says Heiss. “In this situation it’s useful to apply ‘cross referencing’ to better understand what’s going on and to make intelligent tweaks to our lives. For example, I found that–for me–longer phases of stress lead to shorter sleep times, which is often followed by episodes of bothersome back pain.” Understanding this dynamic, Heiss started a new habit: checking his stress level several times per day, and taking more breaks when stress begins creeping up. “This is cross-referencing at work, resulting in better lifestyle design. Rather than trying to fight old habits, which usually is not effective in the long run, we look for smart tweaks that work and don’t hurt,” he says.